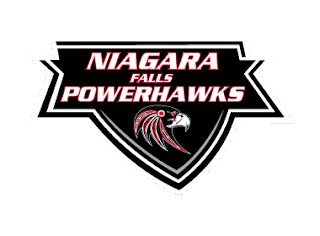 The Niagara Falls PowerHawks dropped a pair of games on Saturday and Sunday in a heated matchup with the Binghamton Junior Senators at the Hyde Park Ice Pavilion. The visitors won Saturday’s night contest in a 7-0 shut out. Sunday’s game, a closer affair, despite the score, was a 5-2 decision for the Senators. Eric Melso opened the scoring for Binghamton Saturday, 11:12 into the first period. Captain Brad Becker and Tim O’Connor were credited with the assists on the powerplay goal. The Junior Senators carried that 1-0 lead into the second period. Binghamton took it to the PowerHawks in the second period, scoring four goals in that frame. Ryan Reifler made it 2-0 at 4:29. Domink Bogdziul and Geoffrey LaMorre assisted. They struck again only 8 seconds later. Michael Padgeon found the back of the net, with Jeremy Wilber and R.C. Randall credited with the assists. The Junior Senators scored again in quick succession with a pair of goals 29 seconds apart by Brad Becker near the halfway mark of the second. Becker nabbed the first at 11:06. Bogdziul and Dinmukhamed Dzhangarashev assisted. He padded the lead at 11:29, with help from Bogdziul and Rory Gresham. They carried the 5-0 lead into the second intermission. Geoffrey LaMorre gave Binghamton a 6-0 lead 13:03 of the third period. Brad Becker assisted. The game was delayed for nearly ten minutes with five minutes left in the game when an altercation occurred in the stands. The ensuing play after the melee was much more subdued as both teams just wanted to finish the game. Luke Miller closed out the scoring for the evening at 18:03. The lone assist came from LaMorre. Brady Anderson stopped all 27 shots faced in the win for Binghamton. Kris Augustine started in net for the PowerHawks before getting pulled halfway through the second period. Josh Mitchell replaced him. Augustine stopped 11 of 16, while Mitchell turned away 11 of 13. In Sunday’s action, both teams skated step for step in the first period, leaving double goose eggs on the scoreboard after twenty minutes of play. Benjamin Beversdorf scored for Binghamton at 10:37. His brother, Caleb, was credited with the lone assists. Brandon Schweickert tied the game for the PowerHawks at 12:54. Andrew Logar and Matthew Minichiello assisted on the powerplay tally. R.C. Randall gave the Senators the lead once again with a powerplay goal at 18:16. Bogdziul and Tim O’Connor assisted. Gage Mueller tied the game again for the PowerHawks at 8:42 of the third period. Matthew Minichiello was credited with the assist on the powerplay marker. Binghamton regained the lead off the stick of Brad Becker at 10:21. Bogdziul and Benjamin Beversdorf assisted. Bogdziul followed up with a goal of his own, shorthanded, at 13:26. Binghamton scored another shorthanded goal into the empty net by Tim O’Connor. Colin Burgess was able to stop 24 of 26 shots in the winning effort for the Junior Senators. Josh Mitchell turned away 31 of 35 shots faced for the Niagara Falls PowerHawks. The PowerHawks will be back in action Saturday and Sunday as they host the Oswego Stampede. Those games will be held at Niagara University in Dwyer Arena. Game time Saturday is set for 7:30pm on the auxiliary rink. Sunday morning’s game is scheduled for 8:05am.